Steadfast truth and uplifting encouragement, thisPocket Inspirations book offers powerful truth andbeautiful design for only $4.99!As sure as the dawn, God? 's faithfulness is new everymorning. The timeless message of this inspirationalpocket size book of promises reminds us that Godwill never stop loving us. That firm foundation offaithfulness frees our hearts to trust God and steadiesour feet to walk the path He has placed before us. beautiful design for only $4.99! our feet to walk the path He has placed before us. 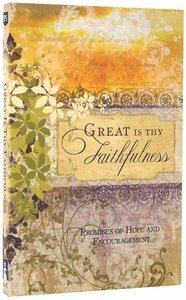 About "Great is Thy Faithfulness (Pocket Inspirations Series)"
This pocket-size imitation leather inspirational gift book features 96 pages of Scripture verses and quotes. Heat debossed pattern design. 10.2 x 7.6cm. A collection of treasured verses from Scripture that will encourage you with hope on your faith journey! This pocket-sized imitation leather volume contains 96 pages and features debossed text on the cover. 10.2 x 7.9cm. A collection of treasured prayers from Scripture to sustain you on your faith journey! This pocket-sized imitation leather volume contains 96 pages and features debossed text on the cover. 10.2 x 7.9cm. A collection of tiny treasures taken from Scripture to sustain you on your faith journey! This pocket-sized imitation leather volume contains 96 pages and features debossed text on the cover. 10.2 x 7.9cm.